Quiet.Panoramic mountain views. 5 minutes to Pollensa, 10 Minutes to Beaches. Beautiful old stone house with lots of original features & full of contemporary art and sculpture. Close to Pollensa town off the old road to Alcudia [Ma-2201] that runs next to Puig de Maria. Large landscaped garden with lawn & pool surrounded by over 3 acres planted with fruit trees;mainly citrus & olives. Covered areas for alfresco dining include a large barbecue area. 2 ground floor terraces. Air conditioning in the bedrooms. Large bedroom terrace. Panoramic views to the mountains, Puig de Maria & over to Pollensa town. We are a retired professional couple who love the house,Pollensa & Mallorca. C'an Sion is a second home which we enjoy sharing with guests for a few summer weeks each year. John & Myra. We have been visiting Mallorca regularly for over 25 years & previously bought a townhouse in Pollensa in 2003. There are many wonderful places on the island but Pollensa has a special magic of it's own. We decided that we would like to have more outside space & yet have easy access to the town. Finally we found C'an Sion & here we are! It is wonderfully quiet with lovely views in all directions & in the short time since we bought the house in April 2011 we can see how lucky we are. We have enjoyed landscaping the garden & preparing the fields & planting over 100 trees:the house now sits in land that complements the handsome building. The sweeping drive lined by oleander draws you in to the lovely house built in traditional honey-coloured local stone. The thick stone walls seem to keep the house cool & there are plenty of windows & doors for light & ventilation. We enjoy the peace & quiet,sitting reading or having a glass of wine on one of the terraces...eg watching the sun go down over the mountains behind Pollensa from the bedroom terrace; magical! We often stroll in to town [30mins] for a short shop & a long coffee ... There are a lot of villas for rent around the Pollensa area but I doubt that you will find many traditional farmhouses that compare to Can Sion. Bed 1;ensuite bath & separate shower,double sink & separate wc. Hairdryer. Bed 2 ensuite shower & wc. Hairdryer Bed 3 ensuite bathroom with bath & separate shower, wc. Hairdryer. Downstairs loo. In all bedrooms + fans in bedrooms & living room. Large living room with satellite TV & dvd. Well furnished. 2 sets of double doors to large outside dining/seating terrace.Original features. Writing desk with modem for wired or wireless broadband. Spectacular views from all doors & windows. More than most people will need! Electric fan oven & induction hob. fridge freezer, dishwasher, microwave. Water filter - separate tap/owners use this for drinking water - avoiding need to buy all that bottled water (this is well water). Original features. Large terrace at front Large covered terrace with sitting area & dining table LargeTerrace off master bedroom with sitting area All have spectacular views all around. Pollensa golf course is 5-10 minutes. Outside: Private pool approx 8m x 4m. Large lawned & landscaped gardens surrounded by fields planted with fruit trees.7 sunbeds & 4 sunshades. Large traditional covered BBQ area with seating/dining for 8-10. Covered downstairs terrace with dining for 8. Separate outdoor furniture. Sweeping drive lined by white oleander from automatic gates. Panoramic views everywhere to surrounding mountains, Puig de Maria & over to Pollensa town. Utility Room: Separate utility room off the rear porch with washing machine & tumble dryer, iron & ironing board etc. Cleaning / Towels / Linen / Maid service: Weekly towels (including separate pool towels)/linen & maid service. Extra changes can be requested for an additional charge. Pool towels are included. Other: Large entrance door into hall with stone arches leading to living room & dining room. Further arch leads from dining room to farmhouse kitchen. Broadly open plan living with 'rooms' separated by arches. We stayed at Ca'n Sion last summer for 1 week with our 4 and 7 year old children and we had a wonderful holiday which exceeded our expectations. We have had time to reflect on our holiday before writing this review and our memories of this holiday remain as positive as they were when we left the farmhouse to fly home! The farmhouse is situated in large peaceful fenced gardens with a private driveway so the area was very safe for the children and there were lots of areas to explore! The swimming pool was a good size, very clean and well maintained with comfortable sun beds dotted around for some relaxation and sun bathing. The farmhouse itself had everything that we needed for our stay (and more!) - it was clean, spacious, well equipped and very comfortable for a family. There was a lovely covered seating area at the side of the property where we could sit during the heat of the day and appreciate the stunning mountain views while keeping an eye on the children in the garden or the pool. We used the BBQ on several occasions which also has a separate eating area that made it so convenient for outside eating. Ca'n Sion is well placed for Pollensa town and for visits to the local beaches. We hired a car for the duration of the holiday as it would be difficult to walk into Pollensa along the narrow roads without suitable transport. There are two well equipped supermarkets nearby and the market in Pollensa is well worth a visit. On a separate note, the owners (John and Myra) were absolutely marvellous and made us feel very welcome during our stay. Prior to the holiday John kept in close contact with useful information and we also found that he responded very quickly to a minor maintenance issue during our stay. We had the pleasure of meeting Agustin (who oversees the maintenance of the farmhouse and pool) when he came to fix the problem in a very prompt manner. He was absolutely charming and really could not do enough to help. The added extra of friendly and caring hosts made the holiday perfect for us in every way. Overall, we had a fantastic holiday and are keen to come back and visit Ca'n Sion again. Hi Abby & thanks a lot for your kind review of Ca'n Sion and of course we will be very happy to welcome you back. Had a fantastic week long stay at Ca'n Sion. The photos genuinely do not do it justice ! Positioned close to the old town It's a perfectly located to visit the great restaurants and bars. You will still need a car that said It's only a short taxi ride into town. Before and on arrival instructions and information from the owner were clear and easy to follow. The property itself was spotless and is clearly maintained to a high standard. Had everything we needed for our stay. I would have no hesitation in going back again, especially with that view from the bedroom terrace ! Really pleased that you had a good time at Ca'n Sion and of course you are welcome to return! Comfortable and well appointed villa in a pleasant location. We stayed for a week at the beginning of July with our two adult sons and their partners. We found the local supermarkets en route without any problems and were able to stock up with bbq essentials and arrive at the villa in time to catch the England quarter final. The villa was perfectly prepared and we quickly moved in and made ourselves comfortable. The villa had everything we needed for a relaxed and relaxing week with plenty of time round the pool and leisurely bbqs featuring the excellent local produce. We took a couple of days out to explore the local area and sample some of the recommended restaurants which for the most part were excellent. All in all we were very happy with both the villa and our stay in Majorca. We had a really great 3 weeks and enjoyed using all the facilities and amenities provided at this superb villa. The pool was a real star of the holiday being used every day to cool off and get some exercise. 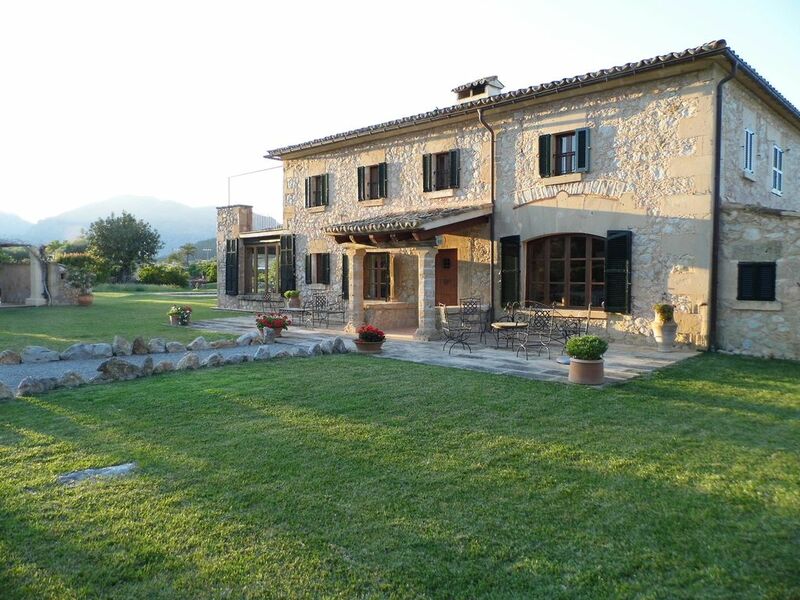 The owner's team were very friendly and helpful and took great care of the villa and grounds. Pollenca is close by but the coast is also a short drive way. I would recommend having access to a car as the road from the villa to Pollenca is not good to walk along. Thanks again for a lovely holiday. After our stay the previous year, we booked-up with John and Myra again straight away for this year. Everything was as we remembered it and perfect for a family holiday. Long relaxing days by the pool in the beautiful garden and BBQs in the evening sunshine. We find the location near to Pollenca, yet only a few miles from the beaches just right. Whilst we usually like to try new and different places each year, it is very tempting to retun again in 2017! A pleasure to welcome you back to Ca'n Sion again this year and although we know that you like to sample different places we will always be pleased to see you here again whenever you wish to return. The most stunning farmhouse with everything you could possibly imagine you would ever need on a holiday - and more! Jon and Myra have made Ca'n Sion into a little haven - and couldn't have done more to make our holiday more special. The information they provided in the run up was exceptional - so we knew exactly what to expect when we got there - but were still blown away by the property. We know the area very well but didn't know the farmhouse was even there. Very easy drive/bike ride to Pollensa Town - and an equally lovely drive/bike ride to Port de Pollensa - which was so much nicer than we remembered. We spent a week at Ca'n Sion with my nieces and nephews and it was such a special week with many treasured memories. Early morning swims, football/games in the garden, long BBQ's (fantastic BBQ hut) - as well as videos once it was too dark to be outside. You won't find a more comfortable/well equipped holiday home - with so many special touches and fabulous art on the walls. We loved it so much that we've already booked for next year. Thank you Jon and Myra for lending your very special home to us. Pollensa has a wonderful selection of restaurants and a beautiful square to sit drinking wine and people watch. It is a very special place.